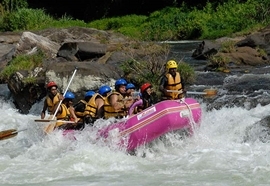 Experience White Water Rafting in the picturesque Kelani River, covering 5 major rapids and 4 minor rapids. This activity is for anyone above the age of 10 years with safety gear, modern rafts, and a comprehensive safety briefing will be given by our white water rafting instructors beforehand. The distance covered is around 5 Km’s. The river and its surrounding will make you feel enchanted, with a memorable Experience during your White Water Rafting Tour in Kitulagala.